When teeth develop fractures, the damage could go past the gum line and expose the inner tissue to harmful bacteria. Which means over time, the risk of a cavity and eventually, a serious infection or abscess, increases. Without treatment, your tooth could begin to ache and may need to have an endodontic treatment performed, such as a root canal, to remove the infected tissue and help repair the tooth. For some, the tooth may even need to be removed to prevent the spread of infection. You should see your dentist right away if you crack a tooth. Since the damage could be invisible to the naked eye, you may consider scheduling a routine visit if you sustain any injury to your smile, even if no damage is obvious. How do we repair the tooth? We may often prescribe a dental crown. The crown fits over the entire visible part of your tooth. We create them using lifelike materials, such as porcelain, zironia, or porcelain-fused-to-metal. The restoration will be custom-made and placed over the prepared tooth. The restoration then prevents any further decay or infection to the tooth as a result of the injury. We’ve also placed them to repair cracks, breakage, advanced decay, or infection. They also aid in tooth replacement by securing dental bridges or restoring a dental implant. If you have a damaged tooth, then we have a way of offering lifelike restoration. 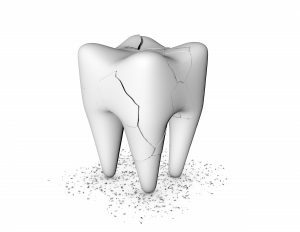 What if your fracture isn’t severe enough to require a full dental crown? In these cases, we may instead suggest another form of restoration: an onlay. The onlay is made from ceramic and fits over the cusps on top of the tooth. They offer repair for teeth that need more than a filling, but not necessarily a full crown. We create them using lifelike materials to ensure they blend with your smile seamlessly. If your tooth does become infected, then before placing the restoration we may perform a root canal. The procedure only takes one visit and involves opening the tooth to remove the infected tissue. We then add a restorative material, which we cure before placing the crown. Our team will help restore your cracked tooth and improve your oral health. Our practice is ready to repair smiles in Des Moines, IA and help patients enjoy optimal oral health. To schedule an appointment, call our office today at (515) 244-9565.